Homemade, family themed Halloween costumes are our favorite family tradition! Our 8 member family makes it a party all on its own. 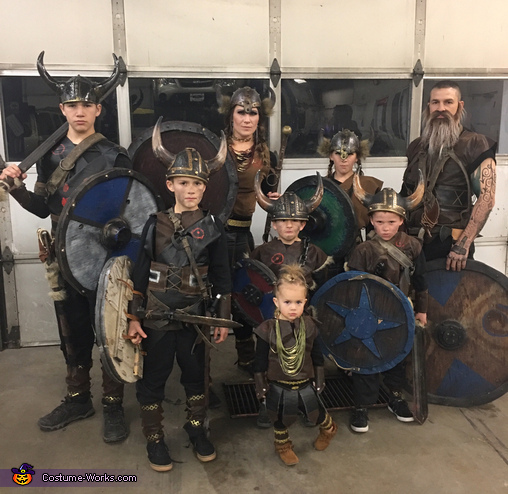 This year we all agreed on Vikings, and we had a ball! For our costumes, we purchased the base clothing, which was just simple black sweat pants and shirts to help us stay warm. Wyoming Halloweens are usually cold and this year was the same. Our tops and dresses were made out of faux leather fabric to resemble Vikings shirts and dresses. They were either wrap around or pull over poncho type tops that made sewing easier. For the arm and leg bands and our belts we used a faux leather and embellished them with snaps or ribbon, and either velcroed or laced them with leather string. We also used old horse rigging to serve as holsters for our weapons. We had both homemade and bought weapons. The homemade swords were made out of wood. We used lots of faux leather to wrap around them and used faux fur as well for embellishing. Our shields were legit and heavy! They were made out an old piece of weathered plywood. We as a family constructed them with dad as the mastermind behind them. Each kid got to decide on how they wanted it to be designed and also painted. We used plastic bowls for the center of some of them and wood for the others. We also screwed decorative bolts to help with our look. We purchased our helmets. The girl helmets were the best quality and best looking. The facial hair was also purchased and helped with the realistic look. My husband had a tattoo artist draw with permanent marker his tattoos on the side of his head we shaved and his arms and hands. The jewelry was purchased on clearance. Our two daughters had hair extensions that we also purchased online that really added and turned lots of heads. My nose ring was a cheap ring that I got in bulk from Walmart. I cut a slit in it, carefully pulled it apart and put hot glue dots on the ends so it wasn't sharp. False eye lashes added a dramatic flare to myself and my oldest daughter as well. We had a great time walking around our town and turning lots of heads Most people didn't recognize my husband, which is his goal every year. We love the bond that it brings to our family. Halloween is our favorite! Thanks for hosting this competition! Fantastic job! Your little one steals the show! So cute!